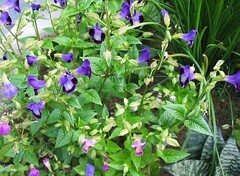 Features: The Bluewings is a low herbaceous plant which is not higher than a foot tall with a spread as wide or lesser. A compact and erect annual bush with toothed leaves and tiny blossoms which have petals of various colors with yellow or white throats. 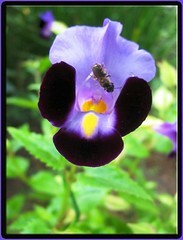 Flowers may be in single color or bicolors of bluish-purple, violet, white, pink, magenta-red or yellow. It’s also commonly named as Wishbone flower as two wishbone shaped stamens that are joined at their tips emerge from inside its corolla tube and will split when the flower is ready for pollination. Usage: They are very suitable as mass planting in flower beds, borders and containers or patio pots, including window boxes. Being non-stop bloomers, they’ll be great ground covers and companions among ferns, hostas and other foliage plants to brighten and add color to the area. 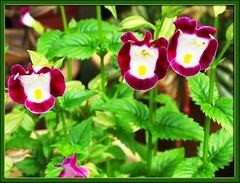 Most attractive too when grown in hanging baskets where their delicately soft stems fall beautifully over their sides. 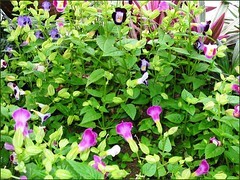 In fact, torenias are most ideal for hanging baskets as they have a mounded to trailing habit! 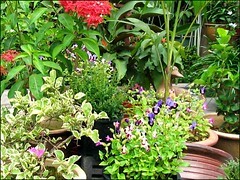 Care: These plants are so fuss-free, easy to grow and needing hardly much attention besides the usual watering and fertilizing! Pinch young shoots to promote bushiness and bloom production! Light pruning by pinching is advisable to help keep the plant in shape. Deadheading is unnecessary as their seedheads are quite pretty. Watch out for mealy bugs and slugs though that just adores them! For temperate regions: Check these well-informed sites, here and here for more plant info. Though blossoms are delicate and tiny, they’re such an asset to our tropical garden! Beautifying every nook and corner with their smiling and colorful faces! Really great performers all through the year! Updated on July 3, 2007 – See the many fancy faces of Torenia in this lovely collage of 9 images of Wishbone Flower, thriving in our garden! thanks so much for this info!!! just bought a blue wishbone plant and put it out on our patio.